I bought this new-old-stock Dandy for a good price – especially considered that they are a little tricky to get by right now since they are discontinued – especially lever fillers with silver trim as this. The colour is officially called Bronze – but I call it toffee or almond-brittle-brown. It really looks delicious. The Dandy has, with its flat top cap, the old-fashioned clip and its straight and slightly tapered barrel a design that reminds of the 1920’s and 30’s where flat tops were in fashion. I have a soft spot for this classic design with rather straight lines and really love the shape of it. One detail that I particularly like is the end part of the cap that is engraved like the side of a coin. A simple detail that brings character. 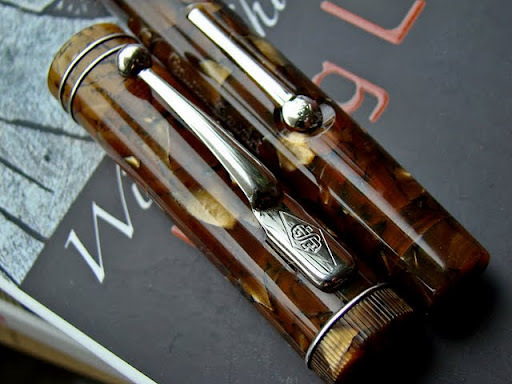 This is a pen made with great attention to detail. Even the lever filler has a little emblem engraved on it and it fits perfectly in place. It is utterly elegant without being blingy – the essence of British style. Today’s Dandy can be traced back to the Dandy that was manufactured during the 1930’s and 1940’s by the original Conway Stewart, which closed 1975. The Conway Stewart of today is a revival of the old company. It was established in the beginning of the 1990’s – aiming to revive and develop the heritage from Conway Stewart and it and started its regular production in the end of the 1990’s. 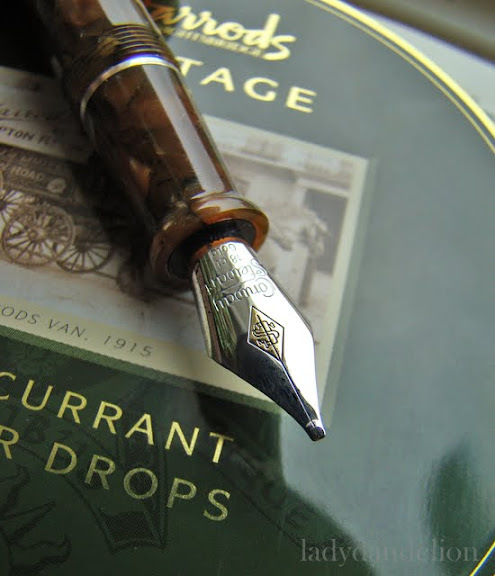 If you’re curious about Conway Stewart’s history and their vintage pens – take a peek here. I longed for one of Conway Stewart’s medium italics and that longing was what made me look for a Dandy (or Duro or Churchill) for a good price. This had a broad nib when I bought it, but I simply can’t write legible or fast with a round broad, so before I bought it I actually checked if the nib could be swapped without costing a fortune. The Dandy is out of production, but when I asked the repair centre in Plymouth, they still had medium italics in stock and was willing to swap my broad to a medium italic nib for a low fee (£10 to cover return shipping and handling) without fuss. If that hadn’t been possible I hadn’t bought the pen. 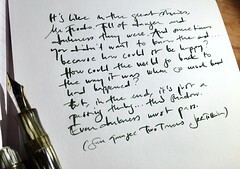 Even if it could be ground to a medium italic by a nibmeister I particularly wanted an original factory italic – they are very pleasant to write with. And – despite some initial problems with the flow, which probably were due to that it was new old stock that hadn’t been used it was precisely the nib I had longed for. Smooth and pleasant – nice to write long letters with. The line variation is somewhere between a stub and a cursive italic and I think it balances well between line variation and ability to write fast. No digging into the paper. 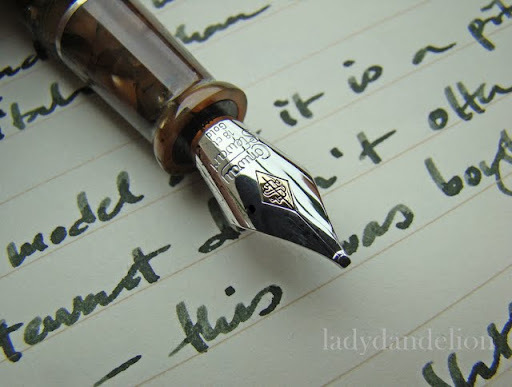 I really like this nib. The one thing I miss is purely aesthetical: a breather hole would bring some character. A little diamond-shaped breather hole – just like their trademark – would be perfect. This is one of Conway Stewart’s best features: that they not only offer one italic in addition to the traditional F/M/B; they offer italics in three sizes as well (except for the Coronet, but I’ve already written about that). Considered to which price segment their pens belong I find it natural to offer more than standard options to choose between. The Dandy originally came as a lever or a cartridge/converter filler. This one is lever filled. The lever works well and smoothly and it is rather easy to fill and flush. I also like that it is possible to resac a lever filler without being a whiz on pen repairs. The big drawback is that it is impossible to see the ink level, which I find frustrating. This stylish lever does add character and refinement, so I do like it in this pen – beauty beats function for once. As mentioned above: This is a well made pen. It is a smallish medium sized pen that is comfortable to grasp – I like the section very much. Everything fit together well. The cap sits quite securely, but might unscrew if worn in a shirt (I never wear pen in shirts or pockets). It posts very well and is well balanced to write with both with and without the cap posted. It is made to be used – not to be eye candy only, which I like. The acrylic it is made of is really beautiful and has a lovely cracked pattern – partly shimmering, semi-translucent and with a broad spectra of beautiful warm, brown hues. It looks spectacular in bright, warm light – all lights. The clip works fine – it might be a little too tight, but that is better than the opposite. Well made – it feels like it have been put together by a skilled hand. I know that I often speak of my pens as being iconic and I’m afraid that I have to say that even this is a little icon. Not with such an impact as the Montblanc Meisterstück or as futuristic and original as the Pilot M90, but as an icon for classic, British pens. It is therefore a pity that Conway Stewart decided to discontinue the Dandy – one of their true classics with roots from the 1930’s – which also is the perfect little sibling of the Churchill. It is almost equivalent of Montblanc choosing to discontinue the cigar-shaped Meisterstück. Ironically the Dandy Heritage (a truly beautiful pen) is one five nominees to Pen Worlds Reader’s Choice Award 2010 in the category “Brand Icon – The pen that is most true to its brand tradition”. Hopefully Conway Stewart catches the message and reinstate Dandy in the regular production again. 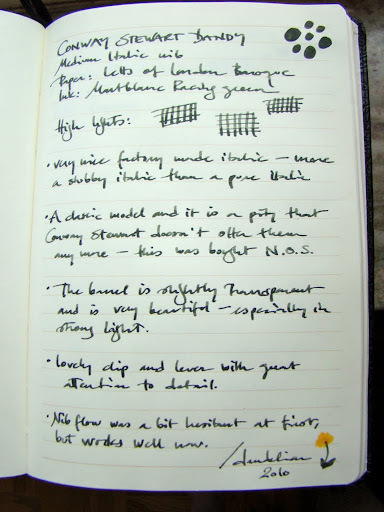 This entry was posted in conway stewart, design, england, fountain pens, inks, Letts of London, montblanc, pens, photo, writing and tagged branding, conway stewart, design, fountain pens, letts, montblanc, pens, photo, pilot, reviews, writing. Bookmark the permalink. Another lovely review–what a pleasure to read. And here I go again–I must brag about your superior and poetic command of English! Very interesting that you have the MB discontinued Racing Green in the discontinued Dandy. Oh, yes, I did see your great review of the greens. Thank you! Have you seen the Conway Stewart Plumage in the Mandarin Yellow? Surely Dandelion has a yellow fountain pen or two in her arsenal on the first day of summer. Can’t wait to read about those! Fascinating. Thank you so much for such overwhelming feedback – it means a lot! I must admit that the closest I come to a yellow pen is my tiger patterned Stipula Ventidue and my Lamy Vista that is filled with Diamine Sunshine Yellow. Thanks again! I agree! The mention of martini.de and ebay enable me to add several beautiful Stipulas to my collection at bargain prices. 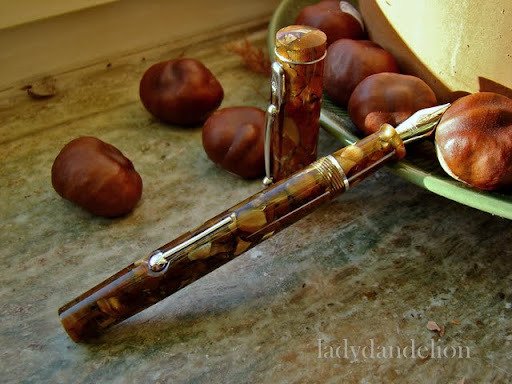 This is really a beautiful pen. I love the design and I agree it’s one of the best “retro-classics” out there. This CS has a lot of presence, so much so that it pops out at you in those lovely pictures. Of course I have a soft spot for lever fillers and think all pens should have that as an option (yes, I am crazy). Topping it off is such a nice nib to boot! I never noticed your little dandelion at the end of the written page before. Very cute.